New Guide for Health Care Providers! 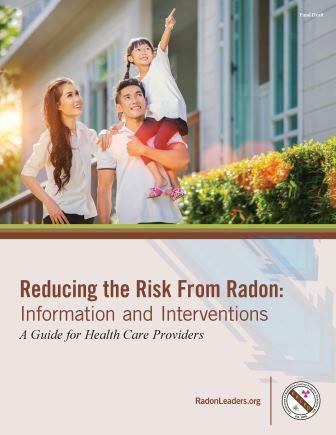 The Conference of Radiation Control Program Directors, Inc., has developed a new guide for health care providers titled Reducing the Risk From Radon: Information and Interventions. This guide was designed to furnish health care providers with the information they need to reduce their patients' exposures to radon. Radon is estimated to cause about 21,100 lung cancer deaths per year and is the leading environmental cause of cancer mortality in the United States. With 40 percent of Pennsylvania homes having higher levels of radon than the Environmental Protection Agency considers acceptable, the Department of Environmental Protection encourages Pennsylvanians to perform a simple test for this known human carcinogen. The joint meeting of the 27th National Radon Training Conference and the International Radon Symposium was held October 2-4, 2017 in New Orleans, Louisiana. The conference was hosted by the Conference of Radiation Control Program Directors (CRCPD) and the American Association of Radon Scientists & Technologists (AARST). Over 400 participants from the public and private sector, non-profits and universities attended four days of training, presentations and concurrent workshops. Presentations made on day one at the joint opening sessions and the CRCPD meeting for days two and three are available in the resources section or by clicking here: Presentations—27th National Radon Training Conference. BOSTON - The state of Vermont has received $105,000 that will support efforts to reduce exposure and health risks of radon found in buildings and schools. The Vermont Department of Health received funds to provide long term test kits for homeowners, and to promote radon-resistant construction techniques in new buildings and renovations. The project will also offer technical assistance for assessing and reducing radon in schools. The State of Vermont matches the federal award with 40 percent state funding to support actions in the state's approved work plan. Radonleaders.org now has a section dedicated to the national radon action plan (NRAP). The NRAP is a strategy for saving lives coordinating the actions of three federal departments and nine national organizations. It highlights progress in addition to describing strategies to reduce radon risk. Click NRAP for more information. You don’t have to smoke to get lung cancer. If you’re unlucky and don’t take precautions, all you have to do is breathe the air in your home. Radon — a colorless and odorless radioactive gas found in soil — causes more than 21,000 deaths from lung cancer every year in the U.S. — more than carbon monoxide and house fires combined. Released from rock, soil and water, the uranium-derived gas can reach dangerous levels in even the best-built homes.